I just received the newest release, Open Mic At The Knick, by the Knickerbocker All-Stars and it's excellent! Opening with the swinging You Upset Me Baby, Ricky King Russell lays down some really hot guitar riffs and Sugar Ray Norcia leads the way on vocals. Al Copley smokes the keys backed strongly by horn section, Doc Chanonhouse (trumpet), Bobby "Breeze" Holfelden (trombone), Rich Lataille (sax) and Dennis Cook (bari sax). Smokin! Up next is Turn On Your Love Light and Malford Milligan commands the stage on vocal. Vocalist Willy Laws has you in the palm of his hands from the first note of Mother-In Law Blues. Russell steps up with some really tasty guitar riffs on this track and the horn section keeps a real traditional early modern blues feel. Very nice. Milligan is back on the mic for Love Disease and an excellent sax solo from Lataille and Muscle Shoals like guitar work from Nick Adams make this song a standout. Johnny Nicholas takes the lead on the classic Jelly Jelly. Al Copley lays down classic blues riffs on this track and it's slow, easy pace makes for a cool opportunity for Russell to really step out with some nicely articulated guitar riffs. Very nice! On Reconsider Baby the band gives the track a real warm feel with a smooth horn backing and super guitar highlights. Again I find myself really groovin to Russells tasty guitar riffs. On jump track, It's Later Than You Think, Copley really has the keys rolling and the horn section is really pushing as Norcia does a great job on lead vocal. Ain't That Lovin' You features Curtis Salgado on lead vocal and his vocals are top notch. Channonhouse , Holfelden, Lataille and Cook really blow the doors on this one. Willy Laws takes the lead on Five Long Years really gripping the feel of the track. Copley inserts some solid piano riffs but it's Russell who takes center stage instrumentally with a blistering guitar solo on this one. Excellent! J.P. Sheerar with a much heavier voice, takes the mic on Somebody's Got To Go and again Russell shows what a perfect choice he was as the guitarist for this set. The man just sits in the pocket and cherry picks his solos. Lataille plays a really rich sax solo on the track as well over the masterful key work of Copley. Brilliant. Brian Templeton is on lead vocal for Tore Down. It's nice that the vocalist from track to track are different giving a cool blend of textures with the same band. Templeton has a great voice for the swing and Russell again is right there adding just the right touch of hot guitar over the horn section. Along About Midnight features Nicholas on vocal and has a cool laid back pace. The band wraps itself around the core feel and Russell steps up with just the right amount of throttle. Very nice. Rocker, Going Down really kicks it up a notch with Russell and the horn section at full throttle. Bob Worthington on bass drives it along and featuring Dave Maxwell on keys and tight drumming from Bobby and Fran Christina on drums, is a super conclusion to a hot set! We at Blues Radio UK love this cd. A must have for your blues record collection! 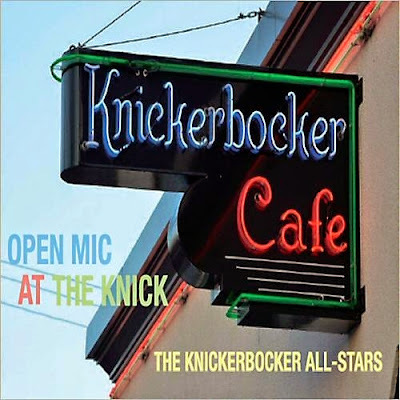 I've read your post "JP Cadillac Records artists: The Knickerbocker All-Stars - Open Mic At The Knick - New Release review". Informative sharing.